We must wake up very early this day as our flight leaves at 6 AM. This makes we will be in Seville early too. We must then take the bus from airport to city center and change to another bus in the place in the map labeled as “El Prado” to reach our hotel. 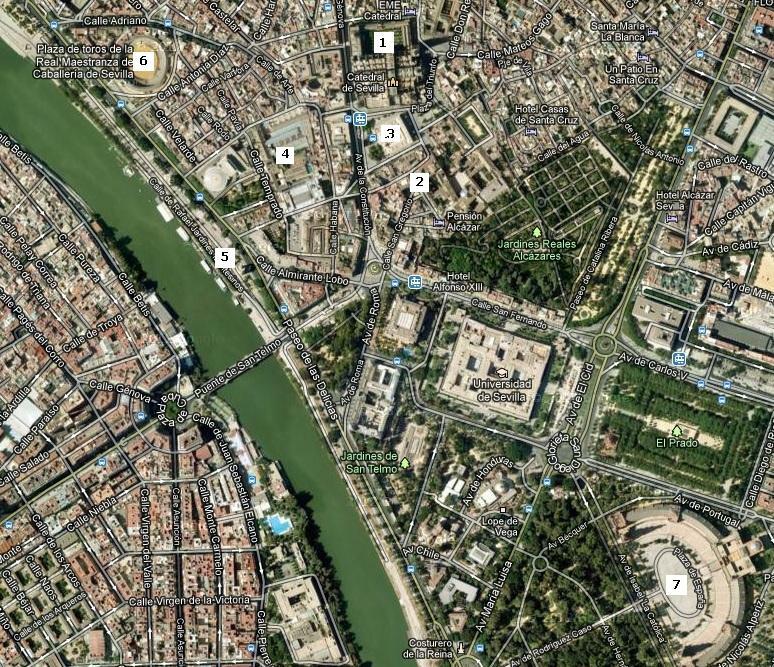 As it will be so soon as per getting our room we will need to leave the baggage there and taking again a bus to El Prado to switch to a tram to the Cathedral area, shown in the map. We take advantage of the amount of highlights concentrated in this area: Santa Cruz neighborhood, as per not getting so tired this first day. It’s expected we will get our hotel early in the afternoon to rest for next days. We don’t manage to park in El Prat town on time for taking the N17 bus to the airport as we planned, so as we’re afraid of missing our flight we leave the car in park&fly. We go directly to the boarding gate passing by the security control very quick as it is quite empty. At 5:30 AM, as scheduled, we’re in the row for boarding the plane. No issues in our flight and we’re walking out of the plane, still at dark, at 7:30AM. The daylight is appearing while in the EA bus through Seville, which we’ve taken by 2.40€ per person. When we’re out in Prado the sun is shining and we locate Tussam office where we purchase a couple of 3-days touristic tickets by 10€ each. Now we’re ready for going to our hotel and bus 34, the one going to there, has a stop just across the street. Our hotel is in front of Betis’ stadium, Benito Villamarin, which helps a lot when we need to know where to get out from the bus. Hotel Silken Al-Andalus is not disappointing and looks fantastic. Also, they give us a room on despite of the early we’re coming, 9AM, so we can rest a little bit before leaving for our visits for today. We take bus 34 again to Prado and get into the tram once there. It takes us in a very short ride to the Cathedral. We’re going to spend the whole day just in this area. It’s almost 11 AM when we reach the entrance of Real Alcazar for our first visit today. We planned starting here as Cathedral opens later, at 11:30 AM. We pay 8.50€ per person as admission fee and we start by organizing this visit with the map we’ve just got of this big place full of rooms. We start by the down side of the map, exploring all the rooms and halls from down to up and leaving the large and sumptuous gardens to the end. The complex is extraordinary with amazing courtyards and halls. Gardens are full of fountains of every kind and vegetation is carefully organized creating beautiful areas. They’re made to get lost inside. We like everything here, a lot, and it seems we’ve started with one of the main attractions. As we cannot exit from the same door we used for getting in we look for the nearest one as our next visit is to the Cathedral, which was just in front. Entrance to Cathedral is marked by the same statue of metal being at the top of Giralda tower and after the door there is a desk where we can pay the 8€ per person as admission fee. This Cathedral is spectacular, very big and full of magical corners, as the one with the burial site of Christopher Columbus. But this visit wouldn’t be completed without being at the top of Giralda, so we start climbing by its 35 ramps to the bells passing by windows offering a preview of what we can expect at the top. 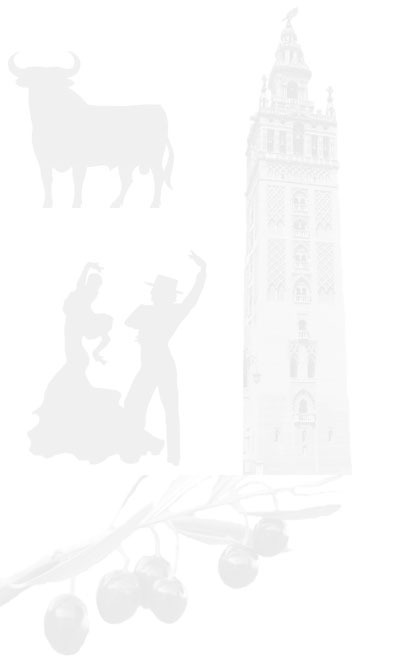 Once in the top, a square terrace offers 365º views of Seville with the bells over our heads. Once back in the cathedral, we close the circle we’re following for visiting it exploring the treasure rooms and ending in the courtyard of the orange trees, at open air. We’re tired because of the climbing, but next visit is just here: the Archive of the Indies. It is a perfect square shaped building and admission is free. We find the entrance in the street with the Christmas market. There is a security check and then, upstairs, we find an exhibition of old documents in display. They’re original and photos are not allowed. Once outside, we start walking by Santa Cruz typical streets looking for a place where lunching. It’s quite simple as these streets are really full of restaurants. After some walk we find Salvador Square, which is crowded due to a bar where a lot of people are drinking some beers with some tapas in front of the church, which is in our list of spots to be visited. We choose a small restaurant nearby for lunching menu of 8.90€. We end fully satisfied of the meal, quantity and quality, and even we’re served a couple of orujo shots on the house. We’re used to hidden costs, but it is not an use here and the total bill is 17.80€. We’ve decide to visit Salvador church now we’re here and I’ve located C5 bus stop, just beside the City Hall, which we can use for reaching a 34 stop passing by Maestranza and Torre del Oro in the way. The square is full of orange trees, a kind of tree we’re seeing everywhere in this city. We’re noticing a characteristic architecture for the churches facades here, which are not showing the liturgical use of the building and, as the rest of facades in Seville, they’re appearing in two colors as if all they were just painted. Inside, the church is gorgeous, with an overloaded Baroque altar. We wait for C5 bus which results to be a minivan model, securely because of the narrow streets it must be run through. We indeed pass by Maestranza and Torre del Oro, but we can barely watching them. We promise coming here tomorrow to enjoying them by foot. When we leave it, we have still a short walk to 34 bus stop. We’re in Paseo de las Delicias and pass by the palace of San Telmo, where the Andalusia Parliament is sited, in front of the river. We deserve this resting for a day we’ve started so early so, as we have some pending sleep, we go for siesta, a healthy nap.